Join Lindsay Guentzel, official blogger and social media correspondent for the 2012 RBI World Series, for an insider's look at this year's events in Minneapolis. Last week, the 16 RBI baseball teams in Minneapolis took part in the RBI program’s first-ever service project in honor of the 20th anniversary of the RBI World Series. Today it was the ladies’ turn to give back. The teams spent the morning volunteering at Kids Against Hunger & ARC’s Value Village, two organizations that have found success helping the community — both locally and internationally. I joined the four teams at Kids Against Hunger in New Hope, an organization that packages meals to be distributed throughout the world. Their goal is to significantly reduce the number of hungry children in the United States while working to simultaneously feed starving children throughout the world. They are currently sending food packages to the Philippines, but in recent months have done significant work in Dominican Republic and even Joplin, Missouri. Last week, four baseball teams joined forces with Kids Against Hunger to help feed over 24,000 people. 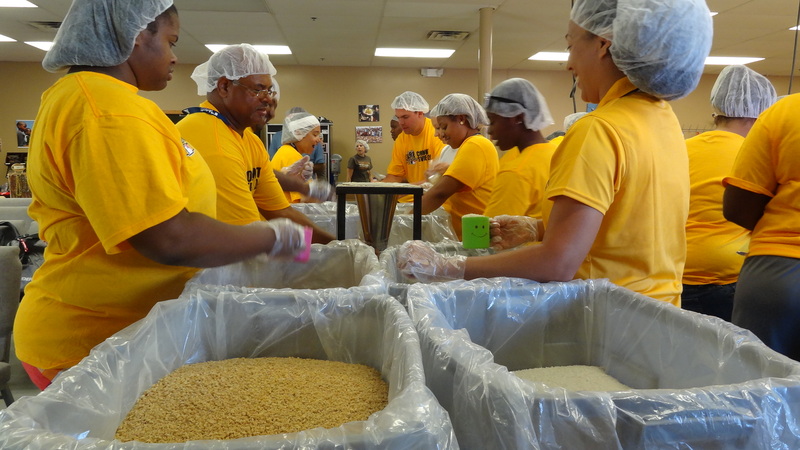 Today the women beat that by packaging more than 26,000 meals — enough food to feed 68 children for an entire year. The teams will head to Target Field tonight to watch the Minnesota Twins host the Tampa Bay Rays and as one of the Kids Against Hunger volunteers pointed out — The RBI World Series participants have helped feed more people than Target Field can hold on any given night. A pretty awesome accomplishment.